- How do I notice if there is an incoming attack towards my city? - What do I need the Watchtower for? - type of mission: attack, espionage, troops transfer, etc. - I see an incoming attack, but I cannot see the troops. What can I do in order to see the troops? To be able to see the troops on the way to your city, you must have a Watchtower that is no more than 2 levels below the espionage level of the attacker. For example, if the espionage level of the attacker is 29, then you must have at least a level 27 Watchtower to be able to see their troops. If you cannot see the troops, keep upgrading the Watchtower. - The Wall: how can it help to defend my city? Note that the Wall only helps to defend the city, but it does not give a complete protection against attacks. - How can I defend my city if someone attacks me? If there is nothing to take, it is not very likely that someone would attack you. For this reason, if possible, try to spend all resources before you leave the game, thus making your city as little attractive as possible for potential attackers searching for resources. a) Ask your fellow tribe members if you may leave your troops and resources in their city/cities for some time while you are offline. This can make sense if there are players in your tribe that are strong enough, so that they wouldn't easily be attacked by someone else. The purpose of such pseudo-espionage or pseudo-attack is secure troops and resources while you are offline by sending them away, not to spy on someone or attack them. 2) Select either "spy" or "attack"
(!) Don't select "attack" in a combination with barbarian camps, otherwise you'll lose one attack on barbarians you have per day; if you want to use barbarian camps for securing your troops and resources, you should only use the mission "Spy". (!!) Note that if you select "spy", you need to select at least one spy. (!!!) 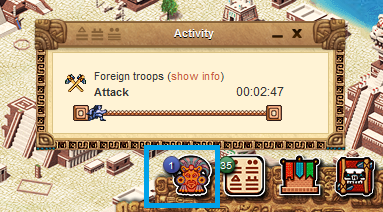 Saving with nahuals: if you have nahuals in your troops, select "attack" instead of "spy", to avoid losing nahuals (because otherwise you always lose one nahual for each espionage mission with nahuals). 5) Press the button "Send troops"
Example: If you need to secure your troops/resources say, for 4 hours, search for an inactive city or a barbarian camp located at 2h distance away from you (2h one way, and 2h return). 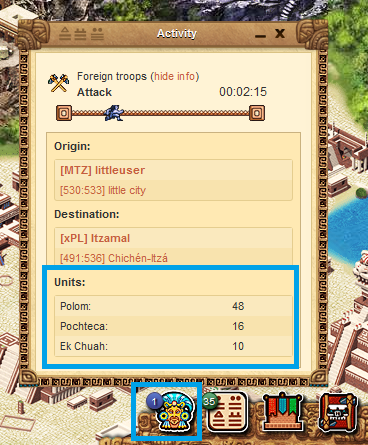 Since the whole army always moves at the speed of the slowest unit, it would make sense to include at least one slow unit, such as Pochteca, or better still, an Ek Chuah, to the troop. - Through the activation of the pacific mode you will be able to save your troops from an attack, but not the resources. The pacific mode can be activated on hourly basis. It can also be activated if there is an incoming attack towards your city. - If you need a complete protection, you can activate one of the Pakal items (for 12 hours/24 hours/3days). - Are there any protection measures from high score players in the game? This protection is activated automatically when a new game account is registered. The beginner's protection lasts till you have 2,400 points. If you not reach 2,400 points within the first 5 days after the account registration, the protection will end after 5 days have elapsed. The beginner's protection ends prematurely if you attack another player (barbarian camps are not taken into account). If one player attacks another player whose score is 75% of the attacker's score or lower and wins the battle, the defender will be granted a protection for the next 12 hours from the attacks of that player. For example, if the attacker has 10,000 points, the defender must have no more than 7,500 points so that the said protection could be activated. - the defender must not attack back the attacker as long as the protection lasts (12 hours), otherwise the defender will lose this protection. It is not possible for a player to attack or spy on another player whose score is 10 times higher or lower than theirs.